How To Restore Missing Text Messages after iPhone update to iOS 10.3? One of our readers reported the text messages missing issues after update his/her iPhone 6 to iOS 10.3. After updating to iOS 10.3, you might face the same problem of “text message lost” just like the user above. If you are the one who is having the similar issue, how can you find missing text messages from iPhone/iPad/iPod touch with the latest iOS 10.3? Actually, the disappeared text messages will be still remained in your iDevice, just make sure you turn on Airplane mode or reduce the usage of your device in case the previous data will get overwritten by the new incoming data. 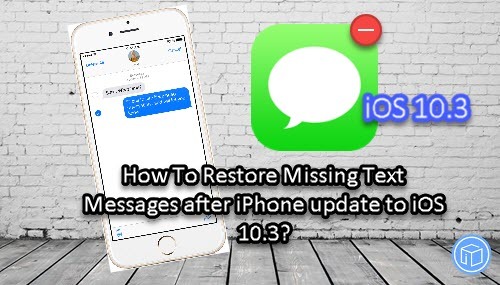 Next we will provide you solution on restoring missing text messages after iPhone update to iOS 10.3 by using a professional iOS data recovery tool even if there is no available backup. iFonebox is an easy and reliable iOS data recovery tool that supports 3 types of recovery mode, which are “Recover from iOS device”, “Recover from iTunes backup” & “Recover from iCloud backup”. If you have backup, you can restore your disappeared data from iCloud/iTunes backup selectively by not wiping all your current data. Besides text messages, iFonebox can also recover notes, calendar, Wechat attachments, WhatsApp messages etc. In this article, we’ll mainly focus on recovering lost text messages on iPhone after update to iOS 10.3. Keep reading the steps below to find your missing text messages. In order to recover disappeared text messages on iOS 10.3, you are compulsory to download and install iFonebox on your computer. There are 2 versions accessible: Windows version and Mac version. This guide will take Windows as an example. Launch iFonebox and select “Recover from iOS device” as your recovery mode after you run the software. Please do not forget to connect your phone with USB cable and if this is the first time you connect your iPhone to PC, you are require to tap “Trust the computer” on your iPhone screen. Then, click “Start” to begin. Select “Messages” under “Text Data” column. Then click “Start Scan” button to begin to scan your text messages on your iPhone with iOS 10.3. After done scanning, you can select “Only display the deleted items” to filter your results if you are looking for deleted text messages/imessages. You can edit the deleted messages before recover. The last step is select the messages you want to recover either “Recover to PC” or “Recover to device”. 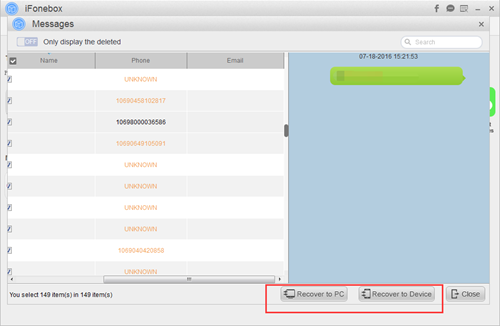 If you select “Recover to device”, you will be able to view your deleted messages on your device directly. iFonebox is such a powerful program on recovering deleted messages on the newest iOS 10.3 even you didn’t back up. Download and give it a try now! This entry was posted in iOS 10.3, iPhone and tagged ios 10.3, ios 10.3 messages recovery by IosdroneD. Bookmark the permalink.